Hookedblog are currently in Oostende, Belgium for the first edition of the Crystal Ship festival which opened last week. As with most coastal cities the weather changes here at a drop of a hat and we have had some heavy rain and crazy north atlantic winds. But yesterday the sun made an appearance and allowed us to bust out our the freshly printed T-shirt which arrived in the post just as we were leaving for Oostende. 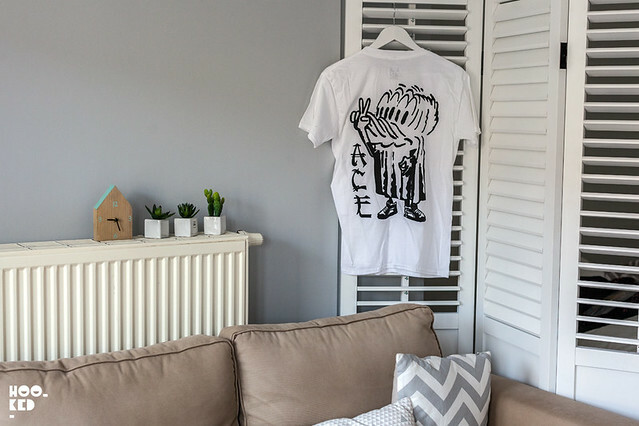 Nothing like a crisp white tee especially with some fresh graphics from London street artists Ace (Previously on Hookedblog). 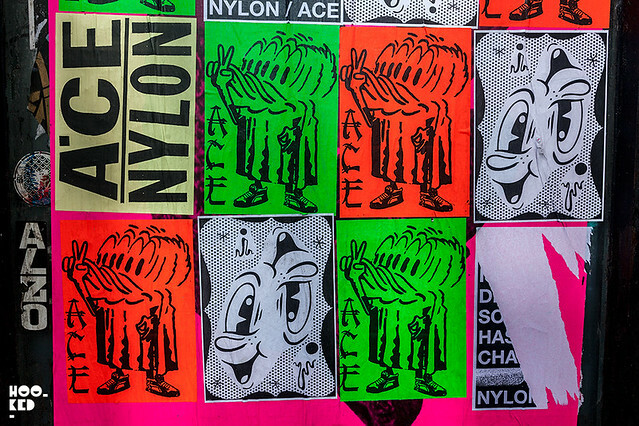 It would appear A.ce London (Previously on Hookedblog) has been back in the studio of late working on new material some of which has started to appear on the streets of East London again. He has also just dropped a run of the PEACEDUCK screen printed t-shirt last week on his Acelondon website — we suggest moving fast on these should you want one as they have been produced in a limited run. 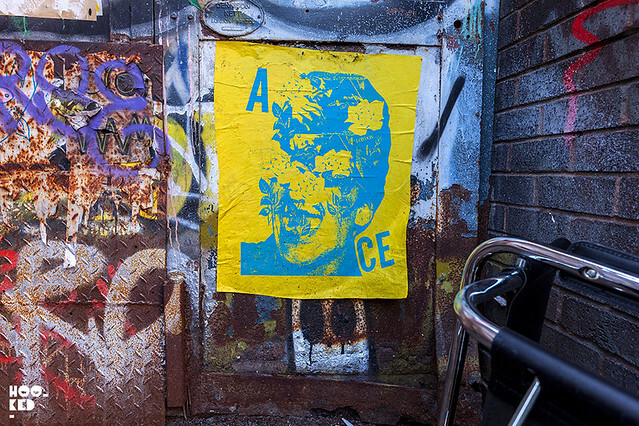 Peaceduck pasteups from Acelondon seen on the streets of East London. Acelondon also dropped us an email and has kindly offered us an additional Peaceduck T-shirt to run a giveaway with and one lucky winner has the chance of winning their own Peaceduck tee which will be sent out directly from the artist. Details on how to enter this giveaway are below. Entrants must log in via the Rafflecopter widget below using either your email address or you can use Facebook account to log in. Once logged in we ask you sign up to our Hookedblog mailing list to enter the competition — this is the ONLY mandatory task. Once you have completed the mandatory task you can gain extra entries in the draw by completing any or all of the additional tasks in the Rafflecopter widget such as following Hookedblog on Instagram or on Twitter, tweeting a link to the giveaway or leaving a comment on the blog sharing with us your preferred t-shirt size (sizes: S / M / L / XL / XXL) and or your favourite cartoon character! Each of the these additional tasks are optional and you can chose to complete one or all of them for extra entries in the competition. For even further entries you can select the tweeting a link to the giveaway task option once a day for the duration of the competition. 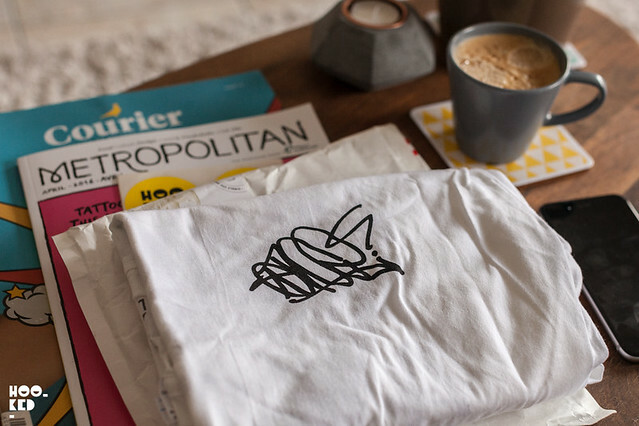 This giveaway will run for a week and closing date for entry will be 15th April 2016.
a Rafflecopter giveaway If you are not feeling so lucky, not to worry you can purchase your own Peaceduck tee online while stocks last via the Acelondon's website here.